Closing the back door is one of the most crowd-pleasing tricks I’ve ever taught my dog, Kirby. It’s also really convenient! The Method: Shaping and capturing. Timeline: The learning curve of a dog is about 4-6 weeks. Depending on your dog, it could take less or more. It took me about 4 weeks to teach this trick to Kirby. Before I explain how I trained this, let’s define a few terms. “Shaping” is a method of teaching that breaks a complicated behavior into small, easily trainable steps that slowly build on each other for the final, desired behavior. “Capturing” is a method of teaching that simply waits for the dog to offer a behavior – the trainer doesn’t need to do or say anything. Prerequisite: Your dog will need to have been previously conditioned to a marker word. I explain how to do this in my ebook 7 Days to a Better Dog. The book is available in my shop or you can join my email list to get it for free. To join my email list, click here. This is all we did for the first few days. I would hold out the paper (the same piece every time) and would mark then reward Kirby for touching it. Once he was reliably touching the paper with his nose every time I brought it out, I knew it was time for the next step. Next, I taped the piece of paper to the back door. He was so used to touching the paper that whenever it was on the back door, he would go touch it with his nose. (Troubleshooting: Only leave the paper taped to the door when you’re actively training.) Once Kirby got used to targeting the paper taped to the door instead of being held, it was time to go to the next step. I am still using “yes” and a small reward each time he targets the paper. Fair warning: Your door may get scratched. 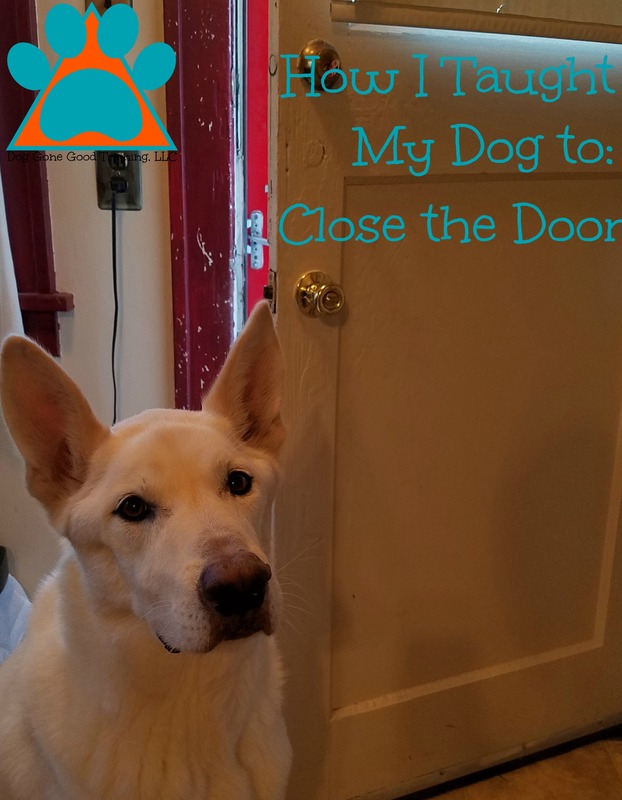 Kirby decided that it was easier for him to use his paws to shut the door instead of his nose. I was ok with that. If you are not ok with that, then only reward your dog if they use their nose to shut the door. Or, purchase a clear, plastic door protector to prevent scratches.